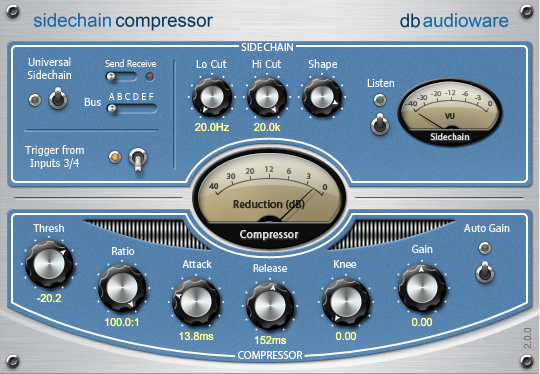 Sidechain Compressor by db-audioware is a Virtual Effect Audio Plugin. It functions as a VST Plugin and an Audio Units Plugin. Created to satisfy a long-standing demand for side-chain capability missing in many audio software packages, Sidechain Compressor features db audioware's Universal Sidechains. This proven technology gives the plug-in true multi track side-chaining operation in most audio programs running on Mac OS X and Windows, independent of the native routing offered by the host software itself. Multi track side-chaining allows one track to control the dynamics of another. Traditional applications range from broadcast voice ducking to intelligent gating of drum tracks to remove crosstalk. Sidechain Compressor is also aimed at more creative applications such as synchronised gating and other complex mix techniques found in dance production and electronic music. New compression algorithm that delivers an authentic analogue sound with low distortion. Easy to set up multi track side-chaining, independent of any host routing. Also works as normal channel insert effect. EQ and Shape controls in the side-chain permit radical & fine tuning of the plug-ins' dynamic response and character. Compressor Auto Gain with brickwall limiter supports extreme compression settings with little or no distortion. Dual metering for clear visual feedback. Listen mode to monitor side-chain signal. Full 64-bit internal resolution supports any sample rate up to 192kHz.